The incidences of Lyme disease is steadily increasing, presenting challenges for GPs regarding diagnosis and treatment. This Q&A gives an update on current management in primary care. What is Lyme disease, and how does it spread to humans? Lyme disease, or Lyme borreliosis, is the most common vector-borne disease in the northern hemisphere with a steadily increasing incidence. It is an infectious disease caused by the bacterium Borrelia burgdorferi, a spirochaete passed to humans by the bite of an infected tick. Lyme disease is classed as a zoonosis because infection can pass from animals to humans via ticks. Ticks become infected after feeding on the blood of animals, especially small rodents such as mice, which act as the main reservoir for Borrelia in nature. Larger animals such as deer have natural immunity, but facilitate tick mating and the spread of ticks over large geographical areas. Most laboratory-confirmed cases are from the English southern counties and Scotland, but cases occur throughout the country, including towns and cities. Lyme disease affects males and females equally, and in the UK those in the 45-65 year age-group appear to be more at risk. Anyone whose work or lifestyle brings them into regular contact with ticks, including foresters, game-keepers, walkers, cyclists and gardeners, may be at increased risk. Each year around 10-15% of cases are thought to be contracted abroad, from the USA or mainland Europe. Currently, Lyme disease is not notifiable, but occupationally acquired infections are reportable under RIDDOR (Reporting of Injuries, Diseases and Dangerous Occurrences Regulations 2013, Health and Safety Executive). It is important for GPs to be aware of the increasing problem of Lyme disease in the UK, which is no longer confined to remote rural areas. Tick awareness with prompt effective tick removal is vital in preventing Lyme disease. Increasing public concern about ticks and Lyme disease means that patients may consult their GP at any stage from tick-bite to late-stage disease. Early diagnosis and treatment with antibiotics have a better outcome, whereas diagnosis and treatment of late-stage Lyme disease can be challenging. Following a tick bite, what are the risks? Ticks are arachnids and resemble small spiders. After mating, female ticks lay around 2,000 eggs, which progress through three stages: larva, nymph then adult, each stage taking a single blood meal before moulting to the next life stage. They are found throughout the UK in woodland, moorland and urban parks and gardens with sufficient humidity, and wildlife on which to feed. Ticks are most active during the spring, summer and early autumn from March to October when people are likely to be involved in outdoor activities. In addition to B. burgdorferi, ticks may sometimes carry a range of other pathogens that cause disease in humans. Travellers to Europe, especially Eastern Europe, should be warned about the risk of tick-borne encephalitis virus (TBEV), for which there is an effective vaccine. The risk of Lyme disease transmission increases the longer an infected tick remains attached.5 Tick checks with prompt and effective tick removal using tweezers or tick removal tool are important for prevention. How should ticks be removed? Ticks should be removed by using a tick removal tool and following manufacturers’ instructions, or fine-tipped tweezers. If using tweezers, grasp the tick firmly, as close to the skin as possible, and pull straight out. The Lyme Disease Association sell tick removal tools in their shop (http://www.lymediseaseaction.org.uk/what-we-are-doing/shop/), while they are also available in some vets and pharmacies. It is recommended to pack a tick removal tool in a family first aid kit, while they are also small enough that they can easily be carried in a wallet or handbag. Plastic tick removal tools such as the O’Tom hook and Tick-card are lightweight and easy to take abroad. Further information should be provided regarding early symptoms of Lyme disease and advise return in case of further symptoms. Since the risk of contracting Lyme disease from a single tick-bite in the UK is thought to be low, prophylactic treatment with antibiotics is not recommended. However, a GP may wish to consider and take advice on prophylactic treatment if a patient is immunocompromised or has visited a more highly endemic area, such as the north-eastern USA or Eastern Europe. Prophylaxis with single dose antibiotics is currently not recommended in the UK. What are the early signs of Lyme disease? 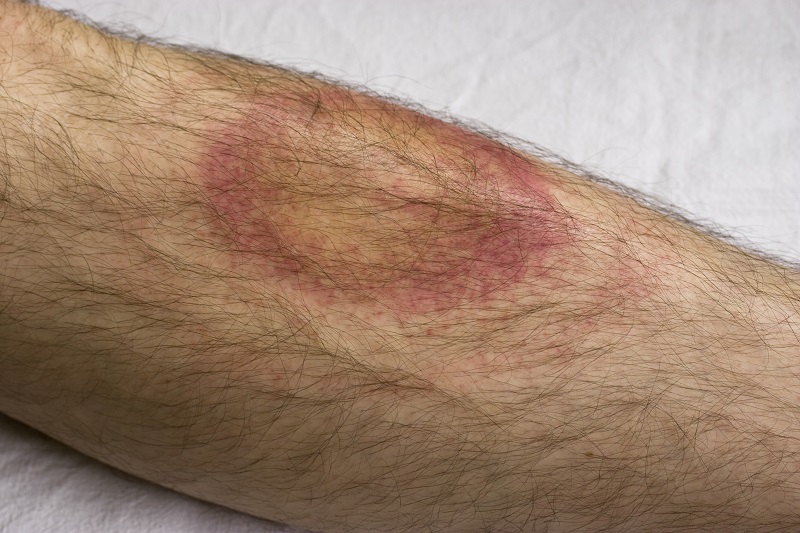 An important early diagnostic sign is the erythema migrans rash (EM), a gradually expanding rash with central clearing which may resemble a ‘bull’s eye’ (Figure 1). In the UK only around 65% of people notice this.8 The disease may be diagnosed clinically at this stage and treated successfully with antibiotics by the GP without the need for blood tests. Rashes may be multiple and distant from the bite-site, suggesting early dissemination. Flu-like symptoms such as headache, fatigue, migratory arthralgia/myalgia, nausea, low-grade fever and malaise may occur due to immune activation. If the EM rash is absent, awareness of this presentation as an atypical ‘summer-flu’ may be a vital clue to early diagnosis. Additional signs may include mild fluctuating cognitive problems, sound/light sensitivity, anxiety and panic attacks. Lyme disease generally does not present with respiratory symptoms and in many cases, fever and lymphadenopathy may be absent. What is the clinical picture in late Lyme disease? Lyme disease can spread over the course of weeks and months to the nervous system, joints, heart, eyes and other organs causing a chronic, debilitating multi-system disorder. What is Lyme neuroborreliosis (LNB)? In the UK around 15-25%, people may go on to develop Lyme neuroborreliosis.8 This can affect the peripheral, central and autonomic nervous system. Aseptic meningitis, with minimal neck stiffness. Diagnosis should be clinically supported where necessary by test results. It is important to enquire about the risk of tick exposure, tick-bite or rash with a careful record of evolving signs and symptoms. Symptoms may be non-specific and overlap with a range of other conditions, including multiple sclerosis, Bell’s palsy, Guillain-Barré syndrome, Parkinson’s disease, stroke, dementia, and autoimmune conditions such as SLE, rheumatoid arthritis and sarcoidosis as well as psychiatric conditions: anxiety, panic attacks, mood disorders, psychosis and obsessive-compulsive symptoms. The relapsing remitting pain and fatigue may resemble chronic fatigue syndrome, ME or fibromyalgia. What tests are used for Lyme disease? Lyme serology, which aims to detect the antibody response to Borrelia, may be negative in the first few weeks because antibodies take time to develop. In the UK, a first tier ELISA or EIA is followed by a second tier immunoblot if the ELISA is positive or equivocal, or there is a strong clinical suspicion of Lyme disease. It is important to be aware that Lyme serology tests have inherent limitations.16,17 There is currently no test for disease activity or cure. Routine blood tests and inflammatory markers are usually normal. Given the limitations of current Lyme disease diagnostics, definitive serological diagnosis of Lyme disease may not be possible on an individual patient basis. If a GP remains concerned that the history and symptoms indicate a probable or possible diagnosis of Lyme disease, even despite standard early treatment, there is the option to contact the National Lyme Reference Laboratory at PHE Porton for discussion of detailed test results and advice (01980 612348) and also Lyme Disease Action (medics@lymediseaseaction.org.uk). All stages of Lyme disease respond to treatment with antibiotics, though early treatment with oral antibiotics is associated with a better outcome. Erythema migrans should be treated with antibiotics immediately without waiting for the results of serology tests, which are likely to be negative at this early stage. Some patients develop a Jarisch-Herxheimer reaction (JHR) after starting antibiotic treatment with a transient worsening of symptoms. This occurs as a result of the inflammatory response when bacteria are targeted and killed, with a worsening of fever, chills, muscle pains and headache. What is the prognosis for late Lyme disease? What needs to happen to improve services for Lyme disease patients? Improved medical awareness and education. Lyme Disease Action is a national registered charity working to raise awareness of Lyme disease and associated tick-borne diseases, and the need for better tests, prevention and treatment. 1. Medlock JM, Leach SA. Lancet Infect Dis 2015; 15: 721–730. 2. Stanek G, Wormser GP, Gray J, et al. Lancet 2011; 6736: 1–13. 3. Strle F, Ruzic&-Sabljic& E, Cimperman J, et al. Clin Infect Dis 2006; 43: 704–10. 4. Robertson JN, Gray JS, Stewart P. Eur J Epidemiol 2000; 16: 647–652. 5. Cook MJ. Int J Gen Med 2015; 1–8. 6. Hansford KM, Fonville M, Jahfari S, et al. Epidemiol Infect 2014; 1–9. 7. Tijsse-Klasen E, Jacobs JJ, Swart A, et al. Parasit Vectors 2011; 4: 17. 8. Lovett JK, Evans PH, O’Connell S, et al. Epidemiol Infect 2008; 136: 1707–11. 9. Cerar T, Strle F, Stupica D, et al. Emerg Infect Dis 2016; 22: 818–27. 10. Stanek G, Fingerle V, Hunfeld K-P, et al. Clin Microbiol Infect 2011; 17: 69–79. 11. Mygland A, Ljøstad U, Fingerle V, et al. Eur J Neurol 2010; 17: 8–16, e1–4. 12. Kanjwal K, Karabin B, Kanjwal Y, et al. Cardiol J 2011; 18: 63–6. 13. Fallon BA, Nields JA. Am J Psychiatry 1994; 151: 1571–83. 14. Nigrovic LE, Thompson AD, Fine AM, et al. Pediatrics 2008; 122: e1080–5. 15. Broekhuijsen-van Henten DM, Braun KPJ, Wolfs TFW. Arch Dis Child 2010; 95: 910–4. 16. Ang CW, Notermans DW, Hommes M, et al. Eur J Clin Microbiol Infect Dis 2011. 17. Lee ang MMG, Ang CW, Berkhout J, et al. The diagnostic accuracy of serological tests for Lyme borreliosis: a systematic review and meta-analysis. 2016. 18. Wilske B, Fingerle V, Schulte-Spechtel U. FEMS Immunol Med Microbiol 2007; 49: 13–21. 19. Dillon R, O’Connell S, Wright S. Clin Med 2010; 10: 454–7. 20. Preac-Mursic V, Wilske B, Gross B, et al. Infection 1989; 17: 355–359. 21. Rudenko N, Golovchenko M, Vancova M, et al. Clin Microbiol Infect 2015; 22: 267.e9–267.e15. 22. Eikeland R, Mygland A, Herlofson K, et al. Acta Neurol Scand 2011; 1–6. 23. van den Wijngaard CC, Hofhuis A, Harms MG, et al. Eur J Public Health 2015. 24. Chandra A, Wormser G, Klempner M, et al. Brain Behav Immun 2011; 24: 1018–1024. 25. Sharma B, Brown A V, Matluck NE, et al. Antimicrob Agents Chemother 2015. 26. Ramesh G, Benge S, Pahar B, et al. J Neuroinflammation 2012; 9: 72.